This is a List of Current & Valuable Resources for all your Leather Craft and Shoemaking projects. When you contact these resources, mention to them that you were referred by the ShoeSchool Website, so they will understand exactly what you are looking for. Leather for Shoes, Sandals, Bags, Garments etc. Links are not an endorsement, used for reference only. "ShoeInfonet provides a maximum of objective information about footwear, components and related industries on a World Wide Level". "The web's most popular shoe resource... the shoe source in every computer". Search for Shoe Information, Repair, Publications, Shoe Trade Events, etc. Your best information source for the Footwear, Leather & Leather Goods Industries, Trade Magazines and a selection of footwear related books. ShoeSchool created an On-line Bookstore in association with Amazon.com. You can order directly from Amazon. An esoteric collection of books for people that really like shoes. How-to books for Leather Craft, plus a wide selection of hand tools, leather and supplies for shoemaking. Pilgrim Shoe Machine in Boston, is a well established family business in Boston, with experienced and knowledgeable people to help you get the right machine for Leather Craft or Shoemaking. Since 1826, Osborne Tool Company has made some very fine equipment for Leather Craft & Shoemaking. You can visit their website and order the machines directly from Pilgrim Shoe Machine. Specializing in flat board steel rule dies for production cutting of component materials for all of your manufacturing needs. MacPherson Leather is located in Seattle, Washington. They have a complete selection of Hand Tools, Leather, and Supplies for Shoemaking. MacPherson is a Distributor for Vibram & Biltrite Soling Materials, and many other brand names of Shoe Repair Supplies, Lacing, Dyes and Finishes, etc. Rogers Corporation produces PORON Performance Urethane insole material. 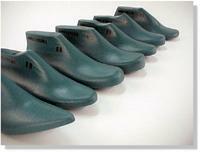 PORON urethane insoles place long lasting comfort in the structural heart of the shoe. For complete details on purchasing insole material contact Rogers Corporation directly from the website. Leather for Shoes, Sandals, Bags, Garments, etc. The Hide House offers one of the world's finest selections of leathers-stocking over 600 types of leather. One stop shopping for all your leather needs. For over 60 years,MacPherson Leather has provided a fine selection of leathers for upholstery, garments, bags, shoes, belts, sandals, tooling, saddles, book binding, laces, rawhide, and sheepskin. They also have a complete Leather Craft Tool Department. ShoeSchool is located in Port Townsend, Washington, on the Olympic Peninsula, 2 hours from Seattle Sea-Tac Airport. 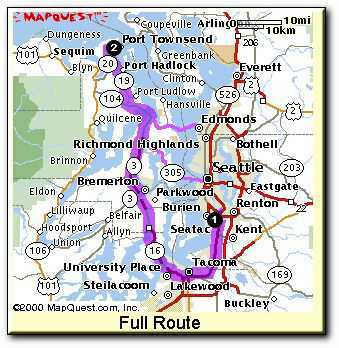 This is a map for 2 Driving Routes from the airport to Port Townsend. One route is driving around the south part of Puget Sound on land, and the other option includes a scenic Ferry Ride. Either route takes approximately 2 hours travel time. This is a link to what's happening in Port Townsend, with information on local events, accommodations, restaurants, etc. This is a link to sites and attractions and accommodations on the Olympic Peninsula, that can turn your visit to ShoeSchool into an real adventure. Links to Olympic National Park, etc. Olympic Bus Lines is an economical and convenient method of transportation between Sea-Tac Airport and ShoeSchool. They offer an overnight hotel package for morning departures from Sea-Tac. Ask about special hotel rates. Trip time from Port Townsend to Sea-Tac is 45 minutes. For complete pricing information, call, or click on "Rates" page. Manresa Castle is a Victorian Hotel that was built as a private residence, by a local business man for his bride, at the turn of the century. Introduction to Shoemaking students stay at the Manresa Castle, with a great view of the water, fine dining room, lounge, and Victorian Library. When staying at the Manresa, you are within walking distance to downtown, and conveniently across the street from a 24 hour grocery store. Palace Hotel is a Victorian Original, located on the waterfront in Downtown Port Townsend. Convenient access to the shops and restaurants located in center of town. The Palace Hotel offers suite accommodations, with kitchenettes and large rooms. The Harborside Inn is a waterfront motel, located at the Port Townsend Marina, with convenient off street parking, elevator, and easy access to all services.